"We measured total mercury concentrations of up to 1,200 nanograms per litre," said Ph.D. student Kyra St. Pierre, a Vanier Scholar who co-led the study with fellow graduate students Scott Zolkos and Sarah Shakil. Permafrost thaw slumps are the Arctic's version of landslides, made up predominantly of ice and mud. "Concentrations of mercury were elevated for at least 2.8 kilometres downstream of thaw slumps," added St. Pierre. "This suggests that some mercury from thaw slumps may be transported for many kilometres through downstream ecosystems, and into larger waterways." "This may release a substantial amount of mercury into freshwater ecosystems across the Arctic," explained St. Pierre, who conducted the study under the supervision of Suzanne Tank and Vincent St. Louis. Mercury is a naturally occurring contaminant that is toxic to humans and other animals in large quantities as it accumulates in organisms and food webs. 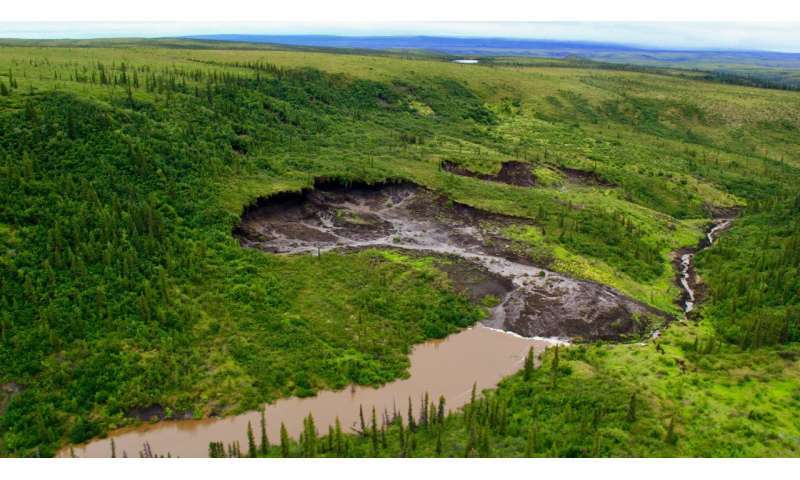 Sediments in permafrost are estimated to store more mercury than Earth's oceans, atmosphere and soil combined. The study, "Unprecedented Increases in Total and Methyl Mercury Concentrations Downstream of Retrogressive Thaw Slumps in the Western Canadian Arctic," was published in Environmental Science & Technology.